Smartphone apps that share users' locations, contacts and other sensitive information with third parties often do so through a relative handful of services called third-party libraries, suggesting a new strategy for protecting privacy, Carnegie Mellon University researchers say. Controlling access to these third-party libraries, which help app developers make money by targeting people with ads or compiling marketing profiles, promises to be an effective way to limit the unwanted release of personal information. The research team developed an app for rooted Android phones that manages interactions with these libraries and informs the user of how each library uses the data. "Each of these libraries may be used by multiple apps on your smartphone," said Yuvraj Agarwal, assistant professor of computer science. "Making decisions about what information to share with each library, rather than just what each app should share, dramatically reduces the number of decisions a user has to make to protect privacy. "It's also more effective because if a user allows even one app on their device to provide a particular library with access to their sensitive information, that's really all the library needs," Agarawal said. The researchers will present their findings and their latest privacy management app at Ubicomp 2017, the ACM International Joint Conference on Pervasive and Ubiquitous Computing, Sept. 13–15 in Maui, Hawaii. App developers use third-party libraries to add functionality to apps, such as using Facebook libraries for authentication. Third-party libraries also enable developers of free apps to make money by linking their app to them. The Google AdMob library, for instance, might access a user's location to target the user with ads, while the Flurry analytics library might gather user information for a marketing profile. Recent versions of Android and Apple's iOS require users to make individual decisions on whether an app can access sensitive information. 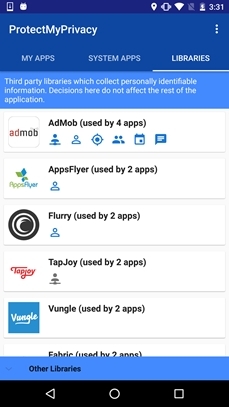 But users do not know why the app needs that access or whether it is related to functionality or simply for advertising. "Users are often overwhelmed by the number of decisions they need to make," said Agarwal, who is affiliated with the Societal Computing program in the Institute for Software Research. The PmP app does not require users to make a yes or no decision about a library — it also offers the option of sharing only some information with certain libraries. In that way, users who appreciate free apps can still help support the app developer. For instance, if a user does not mind that a library knows what city the user is in, but doesn't want to share an exact address, the app can send suitably anonymized location information to the app. "If I tell the library that I'm in Pittsburgh, it can still send me relevant ads, the developer can still make money, but I don't have to give my home address or my detailed whereabouts," Agarwal said. "We're hoping our work will influence Google and Apple," Agarwal said. Google, in fact, provided some of the support for this study, as did the Air Force Research Laboratory and the National Science Foundation. In addition to Agarwal, the research team included Jason Hong, associate professor in the Human-Computer Interaction Institute; Saksham Chitkara and Suhas Harish, both master's degree students in the Information Networking Institute; and Nishad Gothoskar, a senior majoring in computer science and mathematical sciences. An Android app developed at Carnegie Mellon controls access to third-party libraries, which may be an effective way to limit the unwanted release of personal information.